President Donald Trump first threatened to veto and then signed Congress’s massive spending bill that appropriates funds for only a fraction of the wall at the U.S.-Mexico border. 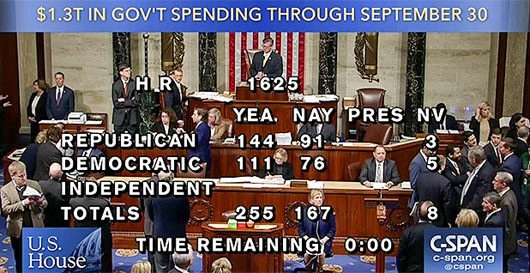 The $1.3 trillion spending bill, which has been passed by both chambers of Congress, appropriates $1.6 billion for immigration and border security for the next six months, including $600 million for the border wall. White House budget chief Mick Mulvaney said the spending bill funds 110 miles of border barriers, of which only 33 miles cover open border areas that have no existing walls or fencing. If the trend of building 33 miles of new border wall per half-year were to continue, it would take between 10-1/2 and 13-1/2 years to complete the project, depending on the exact mileage targeted. Rep. Jim Jordan, Ohio Republican and member of the House Freedom Caucus, expressed the Caucus’s outrage in an appearance on Fox & Friends.